These rotary oil sealed pumps are quiet operating and vibration less designed for continuous duty and factory tested to assure a satisfactory performance. The pump mechanism is contained in metal case with oil level sight gauge and drains plug at base. 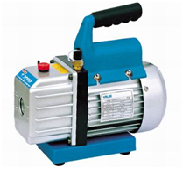 Motor driven pumps are completely mounted on rectangular base plate and are furnished with V belt, Single stage. S-25 Displacement Ltr / Min 25, Motor H.P. 0.25. 4. Compact in design and minimum in weight. 5. Fitted with inbuilt Air Ballast. 6. Quick and easy oil changing arrangement. 7. Easy inspection of oil through window. 8. Thoroughly tested on McLeod gauge. 9. Ready availability of spares. 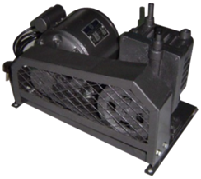 10.Models up to 200 ltrs are air cooled type with single phase Motor. 11. Models beyond this capacity are provided with water cooling jackets with three phase motor. 1. Evacuation of Vacuum Systems. SGM Diaphragm type Vacuum Pump is designed for fast, efficient operation. Its large, powerful composition pulls an automotive air conditioning system into a deep vacuum in record time. Just hook it up to the vehicle, plug it in, and it removes both air and moisture rapidly, assuring thorough dehydration before you recharge. It works on both R-134a and R-12 vehicles with no changeover or waiting time! An industrial strength motor insures long lasting reliability and operation. It can also be integrated into many RTI refrigerant management centers. 6. Totally Dry Compressed Air.